Several years ago I proposed what I called the Indonesian linguistic diversity challenge: create the shortest phrase with the most number of words from different languages, inspired by my visit to the Sekolah Tinggi Ilmu Statistik (Portuguese-Malay-Arabic-Dutch). In a recent Language Log article on Singlish, though, I find a great parallel from Singapore. Nine words with six different languages. Not bad, Singapore, not bad at all. It occurs to one that the use of ‘one’ as a sentence terminator in Singlish, similar to the Glaswegian ‘but’, may be a reference to Elizabeth Windsor as Head of the Commonwealth. That, or some other singularity. The use of “one” is rather common in Manglish (Malaysian English) as well. For example, “They are like that one”. The common use of “that one” in Manglish makes sense, at least, to me as an American English speaker. So, like saying something “No can talk about that one lah” is a bit weird to me but I understand it just fine. 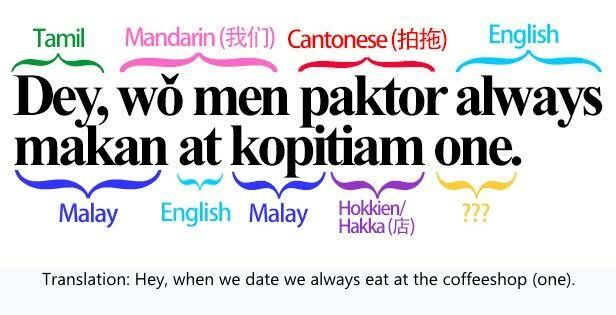 This context of this case “always makan at kopitiam one” is grammatically bizarre to me! It does sound bizarre to foreigners. This sentence sounds common too if you live in Malaysia (Penang Island) and Singapore, “My parents always shop at Tesco one.” Perhaps there are some similarities between Singapore and Penang, lots of hokkien people. My guess of using “one” at the end of the sentence is to doubly emphasize that the act is a very common act.